NJSFWC State President Patty Whitehouse and NJSFWC Communications Chairman Barbara McCloskey were guests Friday, April 20th on the Bert Baron show,1450WCTC. Below is the link to the recorded podcast: http://www.wctcam.com/BertPodcasts.aspx They were able to share with the audience the history of the NJSFWC and explain the kick off of the Operation Peanut Butter, Jelly & Beans project. This initiative is to collect 1 million pounds of food between April and June to restock the shelves of the state's food pantries, shelters, and soup kitchens. Congratulations to the winners of the Lexus CT and the flat screen TV! 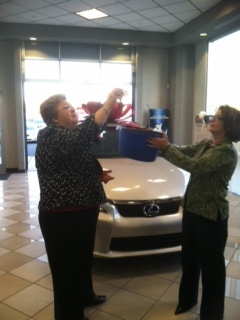 NJSFWC President Patty Whitehouse picking the winner! Thanks to Lexus of Edison Dealership (http://www.lexusofedison.com/) for hosting the reception prior to the raffle drawing and a huge thank you to all the Clubwomen and members of the public who supported this fundraiser and purchased tickets.